WTF? Cycling stuff for confused Barbie folk. Barbie stuff for confused cycling fans (not so much). Who? Cyclist Heinrich Haussler, nicknamed "Barbie." The picture on the bottom of the box shows the real thing on the podium after his stage win at Paris-Nice--larger version here. Why do they call him "Barbie"? He wears big shiny earrings. He frosts his hair--sometimes. Why does he have two passports? Born in Australia. Father is German. Which doll is that? Mattel's My Scene Hudson. My Scene started out as a Barbie line meant to compete with Bratz (before Mattel ate them), which is why their heads are freakishly large. But, thankfully, not as large as Bratz. Explain the title? Barbie Barbie is the male doll. Barbie is the female doll. A "barbie" in Australia is a barbecue. So when Barbie Barbie and Barbie have a barbecue, it's the Barbie Barbie-Barbie Barbie. What's a roo burger? Just what you think--a burger made out of kangaroo meat. Australians. What's a bratwurst? A yummy type of German sausage popular at barbecues. And the point is? See: "why does he have two passports?," above. Why does he have to decide? Haussler's been racing with a German license for several years. He now wants to race for Australia instead, but the UCI (cycling's governing body) is demanding he give up his German citizenship or they won't let him. Haussler doesn't want to give up his Germanity, but he really really wants to race as an Australian, especially with the World Championships coming up next year in Australia. Tough choice--and yes, the UCI are a bunch of dickweeds. Why are you calling the poor boy a loser? I'm not--it's a direct quote from Haussler, after he lost Milan-Sanremo by frickin' centimeters to Mark Cavendish. Why is he on the ground? Haussler got off his bike and collapsed right after the finish. Reference picture over at Pez. Oh. Then shouldn't Barbie Barbie have his helmet on? Haussler did. I don't have one that fits the oversized My Scene head. Call it artistic license. Is that the same Barbie from the barbecue whose leg we see at top? Yes. She's a vintage ponytail Barbie from about 1963 or so. If you care, she's wearing a dress called Cotton Casual and a coat called Red Flare. The other dolls in the scene are. from left to right, X-Files Ken in his original outfit, Ken as Henry Higgins (I think he's wearing the trousers from a Herbert Hoover doll), and the one with the camera is My Scene River (own jacket, but I don't remember where the jeans come from). Don't you usually take seconds? Apart from Milan-Sanremo, Haussler also took second place at de Ronde van Vlaanderen (Tour of Flanders). Months later, after his solo win of Stage 13 in the 2009 Tour de France, Haussler said, "Throughout the stage all I kept on thinking was: ‘don’t finish second, you can’t finish second again.’" By the way, two second-place finishes in the Monuments of cycling is phenomenal. If people think Barbie Barbie is meant to pick on Haussler, they're wrong. Who? 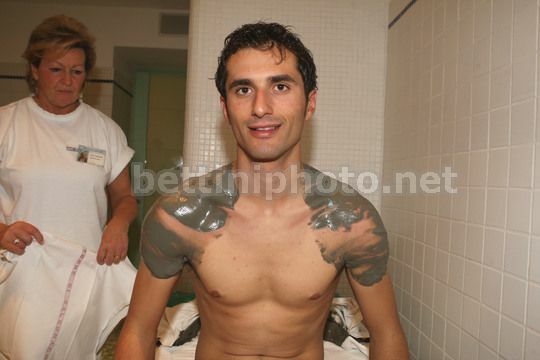 Daniele Bennati, sprinter from Liquigas, known as "Benna" by his many admirers. He's sort of the Edward of Podium Cafe. Why did you put him in a spa? I didn't make this up. One of the infamous mud bath photos here. Okay, but the many grooming products are surely an exaggeration. Yeah, probably. The secret of Benna's perfect skin may never be known, but then again, the Italians are known for their grooming. Will Frischkorn once gloated about the Garmin team getting back to the hotel quickly after a Tour stage in these terms: "...we were watching the race wrap-up on France 3 TV back in the rooms while the Liquigas boys were most likely still blow-drying their hair and spritzing some scent for the ride home." And the doll is...? Another My Scene River doll, not the same as in the one with the camera above (yeah--Hudson and River. All the dolls have names inspired by New York, but they didn't try very hard with River, did they?). Scenes from the BB-BB #3-Picture 1: Whose face is scribbled out on the cover of ProCycling? Mark Cavendish, who beat Haussler in Milan-Sanremo by the teensiest of margins. Scenes from the BB-BB #3-Picture 2: True: Haussler has said his recent trip home to Australia was his first in two years. He stayed in Europe last year and trained instead. Scenes from the BB-BB #3-Pic 3: Why did you use the same picture as #1? I didn't mean to--I shot a different one for this frame, and reused the other pic by mistake. Oops. Scenes from the BB-BB #3-Pic 5: Who? Riccardo Ricco, nicknamed "the Cobra." The oversized white glasses are one of his many infamous fashion mistakes. He's also a cheater, so it's fair game to make fun of him. The doll? Liam, from Mattel's Flava line, a group of urban hip-hop dolls that failed miserably in 2003. Scenes from the BB-BB #3-Pic 6: Banana shaking? What? Ricco is talking about the 2008 Giro d'Italia, where during a heated exchange Alberto Contador shook a (literal, not figurative) banana at him. Ricco climbed brilliantly during that race and finished 2nd overall, just two months before being ejected from the Tour de France in shame for testing positive for the performance-enhancing drug CERA. They recently went back and re-tested the 2008 Giro samples. We're waiting for that shoe to drop. Scenes from the BB-BB #3-Pic 7: Monte Pora was another stage of the same race. Scenes from the BB-BB #3-Pics 8 & 9: Barbie dated GI Joe? Back in the '60s and early '70s, Joe was the date of choice for Barbie for most kids who played with dolls. He was way buffer than Ken, more poseable, and had a cool scar on his face. Poor Ken could not compete. Cobra? Since the '80s, GI Joe's nemesis has been the Cobra Command, usually just known as Cobra. Which, as mentioned above, is also Riccardo Ricco's nickname. Is that a vintage Joe? Nope, a repro from a few years back. Finned Creatures of Curacao: Who? Norwegian cyclist Edvald Boasson Hagen. Reference pic here. What's Amstel Curacao? A race that a mix of top cyclists and/or those who speak Dutch (or Flemish) get invited to after the season ends. They spend a week hanging out on the beach and swimming with dolphins, then earn their keep by competing (sort of) in a race. You can generally figure out who's going to be on the podium before the riders get on their bikes. The dolls? Edvald: A My Scene Hudson with a different hairstyle than the one who became Barbie Barbie. I first thought he would be Linus Gerdemann, but the smile is pure Boasson Hagen. Guy with missing hand: Yeah, that's Abe Lincoln, from the Leaders of the World collection. Mermaid: My Scene Barbie. Or possibly Kennedy. Barbie was deleted from the My Scene line and replaced by Kennedy--same doll, different name. Why does the mermaid have fur? Oh, come on--Amstel Curacao takes place in November! Interview: Did Edvald Boasson Hagen really say those things? I've paraphrased two of them, but yes. Exact quotes and sources: "Sean Kelly? Sorry, I am not so good with cycling history" from Cyclingnews, April 9, 2009; "It was just a long race" and "Do I have to talk about next year?" from Cycle Sport America (print), December 2009; . "Actually, I don't really have any long-term goals" from Procycling (print) October 2009. He's such a terrible interviewee, he must be doing it on purpose. What's the story of the 1939 Ronde? Belgian cyclist Karel Kaers was racing de Ronde van Vlaanderen (Tour of Flanders--one of the Monuments of cycling) just as a training race for the upcoming Paris-Roubaix (another Monument, for those of you who are newish to cycling). He parked his car on the Kwaremont--one of the fabled climbs of the race--intending to quit once he got there, then cycled 40 kilometers back to the start. Since Kaers knew he wasn't finishing, he went full gas early in the race, and reached the Kwaremont with a one-minute lead...only to find that his car wasn't there. His manager had moved it, to force him to finish the race. Kaers went on--and won. Was his manager right? On the one hand, Kaers did earn a hell of a victory at de Ronde. On the other, he ended up finishing 67th in Paris-Roubaix, the race he was training for in Flanders. Bad Barbie Barbie: Who is Ted King, and what's wrong with short socks? Ted King, a member of Cervelo Test Team, looked around at the sins committed against fashion and found it necessary to step up and appoint himself King of Style. In his blog, Ted now grapples with such weighty issues as the wearing of pro kit if you're not a pro, the terifficness of white-on-white, and--yes--appropriate sock length. Look for the King of Style or KoS entries and be illuminated. Is the guy in the helmet supposed to be Thor Hushovd? Yes, and shut up. That's the best I could do. Pippo's tat: Make a tree? I'm hoping the English-speaking folk will get this one--for the rest of you, there's a well-known poem by Joyce Kilmer called "Trees," which ends with the lines "Poems are made by fools like me/But only God can make a tree." I know it's the first thing I thought of when I saw Filippo Pozzato's actual back tattoo. Happy Birthday, Barbie! Yes, it's Heinrich Haussler's birthday today (or it is in my time zone). He's 26. The White Unicorn, if you haven't heard, embodies the forces of good. Snuggies and the Slap Chop are considered to be two of the universe's most useless and annoying inventions. Opinions vary on Cycling TV. The Graveyard of Classics Dreams Crash at Paris-Nice: Yes, Monday's stage at Paris-Nice saw Alberto Contador and Heinrich Haussler involved in a crash. Cervelo's story is that Bert ran into Barbie. 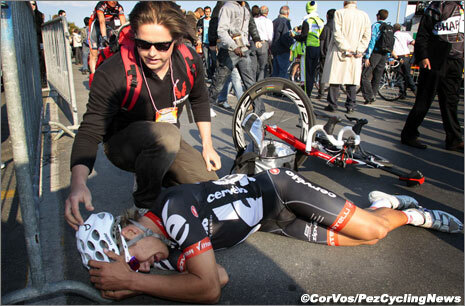 Gert Steegmans broke his collarbone in a freak crash in the Paris-Nice prologue. Disclaimer: To the best of my knowledge, Thor Hushovd is not actually the God of Thunder, and no disrespect is meant to anyone at Asgard for hinting that he just might be. Consequences: What's it all about? According to a statement released yesterday by his team, Heinrich was involved in a car accident a couple of nights ago, and was found to have been driving drunk. The quote at top of this Adventure is from Cervelo's statement. Disclaimer: the people at Cervelo are fine people and would never dream of physically disciplining riders or smacking kittens with maces. This is a work of satire, not a behind-the-scenes exposé. What's that cool t-shirt Barbie Barbie is wearing in the last few panels? Why, it's HH's teammate Ted King's special Giro t-shirt. I have one--you should, too. Available here. Who are the other dolls in the episode? The Cervelo guy (for the sake of argument, let's say he doesn't represent any particular individual) is a Happy Family Alan, the chick in the lab coat is Malibu Barbie, and of course Barbie you've already met. Wait--isn't the guy with the whip Jacob from Twilight? Why yes, he is Jacob from Twilight, and if his inclusion is a little experiment to see how many people reach this page by Googling the words Jacob, Twilight, and whip, then shame on me. But shame on them, first. Hey, you're the one with the Jacob doll. Shut up. I had a gift certificate to use up. Barbie Barbie has one bloody passport: What's it about? Heinrich Haussler was born in Australia to an Aussie mom and a German dad, so has held dual citizenship. He moved to Germany at a young age, got a German racing license, and represented that country in the World Championships as a Junior and U-23 rider. As a pro, though, he has never represented Germany, being careful of a rule that states if you compete for one country, you can't compete for a second country for three years. A couple of years ago Haussler decided he wanted to compete as an Aussie, but the UCI told him if he wanted to switch he would have to give up his German citizenship. He didn't want to, but just yesterday said that he will. See you in Melbourne! One big incentive to switch now is that the World Championships will be in Melbourne/Geelong this year, and Haussler has said he wants to ride for Australia in Australia. Hey--did you really paint Barbie Barbie??? What if it doesn't come off? Don't be silly. That's Backup Barbie Barbie. Okay, once and for all--why are the Australian national colors green and gold when their flag is red, white, and blue? Not completely clear on this, but I believe it has something to do with the Golden Wattle. August 25, 2010: Hey, wait--Heinrich Haussler wasn't named to the Aussie team for the World Championships! We at Barbie Barbie Central regret that our optimism was greater than the selection committee's faith in Barbie's recovery. If we were in charge, he'd be there. Last Day of the Season: What's it about? After a surprisingly few days of rumors, Cervelo Test Team confirmed on August 26 that they will fold as a stand-alone team at the end of the season. Garmin-Transitions (which may or may not change its name to Garmin-Cervelo) will get the bikes, and rumor has it they may end up with some of the riders as well. Here's hoping they all get jobs quickly.